If at first you lose a Senate race … hope for an appointment! Despite a narrow defeat in Arizona’s 2018 U.S. Senate race, Republican Rep. Martha McSally will still be headed to Congress’s upper chamber next year. Arizona Gov. Doug Ducey announced on Tuesday that he is appointing McSally to fill the state’s other Senate seat, formerly held by the late Sen. John McCain and currently held by Jon Kyl, who Ducey initially appointed to the seat; Kyl announced last week that he will resign on Dec. 31. So what might we expect from Sen. McSally? Well, perhaps she won’t be too different from McCain. According to data from Voteview, a system that measures the political ideology of all senators and representatives based on their voting records, both McCain and McSally were more moderate than most other Republicans in the 115th Congress.1 In fact, less than a third of congressional Republicans were more moderate than McSally (29 percent) and McCain (30 percent). Both were squarely in the left wing of their party. 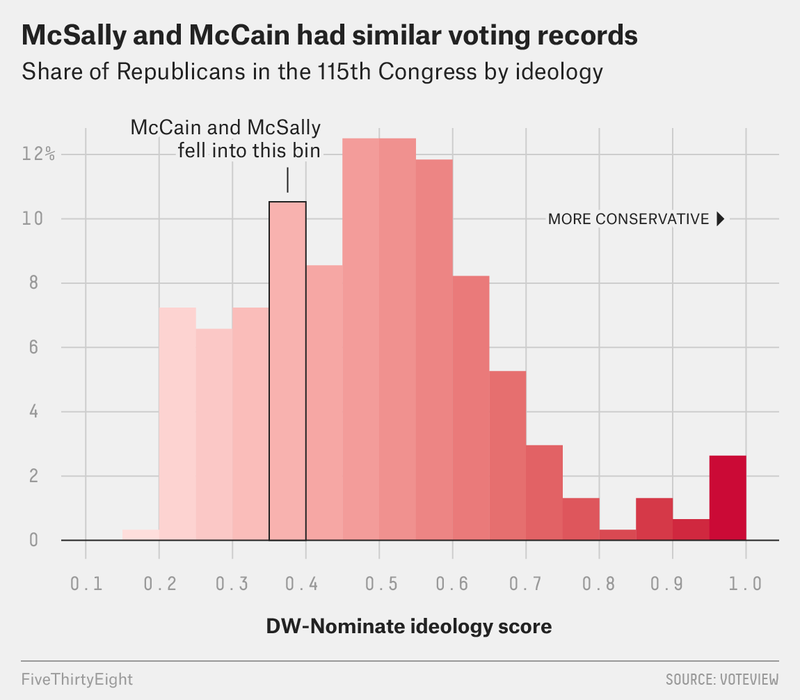 However, despite having a relatively more moderate ideology score, McSally voted in line with President Trump in most cases, according to FiveThirtyEight’s Trump Score. During her two terms in the House, McSally represented the Arizona 2nd, a R+1 battleground district that Democrats won in November. That purple electorate probably influenced her moderate approach. If we just look at McSally’s first term, she had an even less conservative voting record, so she has shifted a bit further to the right during her tenure, perhaps in anticipation of her Senate bid and the fact that she needed to beat staunch conservative challengers like Kelli Ward and Joe Arpaio to win the Republican nomination. Still, Arizona looks likely to be a politically competitive state going forward, so if McSally mimics McCain’s record as a “maverick”, a less-than-hardline voting record might work out for her, electorally-speaking. He did win six Senate elections from 1986 to 2016, all by margins greater than 10 percentage points. Then again, members of Congress sometimes shift ideologically when they move from the House to the Senate. Take Sen. Kirsten Gillibrand of New York, for example. She went from being one of the most moderate Democrats in the House to one of the most liberal Democrats in the Senate. That shift can be partly explained by the leftward shift of the Democratic Party overall, as well as Gillibrand’s potential presidential ambitions. But it’s also reflective of her switch from representing a competitive Upstate New York district to serving a very liberal state. McSally might find herself subject to a similar pull, just in the opposite direction, moving from an R+1 district to an R+9 state. Electoral concerns certainly won’t be far from her mind. Provided McSally stays in the position, she faces a re-election bid in a 2020 special election, and if she wins that, she would then have to run in the seat’s regularly-scheduled election in 2022. McSally’s next primary could also be a real challenge given the dissatisfaction among some Arizona Republicans over how she handled her 2018 Senate campaign and subsequent defeat against Democratic Sen. Kyrsten Sinema. McSally’s record in the next Congress will be an important factor in that primary, as it could encourage or discourage a significant challenger.